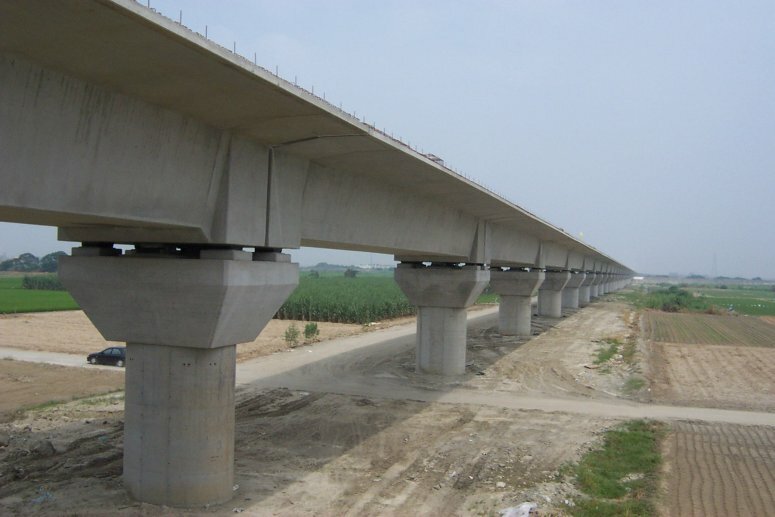 FaberMaunsell, a leading consulting firm for seismic design work, used LUSAS Bridge to assist in the design of seismic resistant viaduct structures and station guideways for Contract C270 on the Taiwan High Speed Rail Project. Response spectrum analysis with LUSAS determined forces in columns. Track-structure interaction analysis derived relative movements and stresses within the rails under earthquake loading. Nonlinear soil-structure analysis determined stresses in piles and pilecaps. Solid element modelling of the end-blocks for the proposed post-tensioning system and shell element modelling of the precast superstructures helped produce local bending moments. The end result? An economical design within a demanding project time-scale. The 345km long High Speed Rail route runs from Taipei City in the North of the country to Kaohsiung City in the South. It will allow trains to travel at a top speed of 300 km per hour. 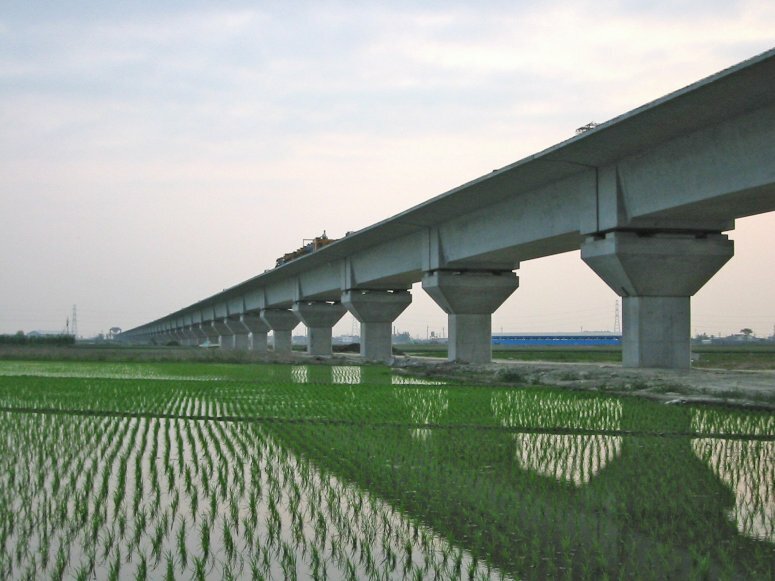 Split into numerous design contracts, Contract C270 requires the design of 38km of standard viaducts through Changhua, Yunlin & Chiayi Counties and a station guideway at Yunlin. 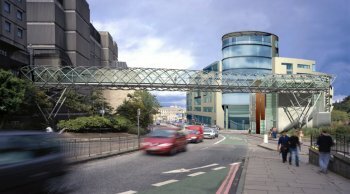 On Contract C270, the viaduct is up to 28m high, and made up of 35m long precast post-tensioned concrete box girders simply supported on single columns. The deck units have free sliding mechanical pot bearings at each corner. Shear keys at either end of the span provide transverse restraint with one end fixed longitudinally. Bored piled foundations of 2m diameter and up to 60m long support the viaduct. 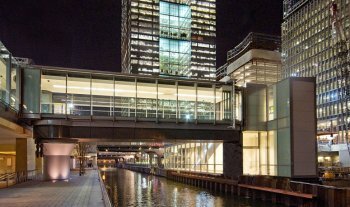 Station guideways are of similar construction but with twin box-girders and RC portal-frame supports. The viaduct needed to meet three key requirements: strict ride performance criteria set by the client for normal operating conditions; remain within the elastic range and restrict movements to specified values during a significant seismic event so that a train may stop safely; and to support the design loads and suffer only repairable damage from the maximum design earthquake. To achieve these requirements four distinct analyses involving the use of local and global LUSAS models were required in order to prove the suitability of the design. To analyse the entire 38km long viaduct required the creation of 70 separate models. FaberMaunsell introduced automation wherever possible to enable the analysis to be carried out efficiently. A Visual Basic Script was written to read geometric data for the viaduct, such as column dimensions, span lengths etc from an Excel database and built 3D beam models in LUSAS for the global seismic analysis and track-structure interaction automatically. This reduced the cost of creating new models and provided confidence that the models were "machine perfect" every time. In these models, joint elements were used to represent concentrated masses, foundation stiffnesses, bearings and shear-keys. For each model, acceleration response-spectrum analyses were carried out and the effects of up to 200 modes were combined using the CQC method. Analyses were run in three orthogonal directions separately and combined according to the project requirements. In these analyses the stiffnesses of the adjacent piers could vary significantly, particularly in the station guideways and at non-standard spans. The multi-modal spectral response analysis determined the seismic demand allowing for variation in pier stiffness, which would not have been possible using single-mode equivalent static calculations. From these global analyses column design forces were obtained and used for reinforcement design. For the pile and pile cap analyses 3D beam and shell elements were used with Winkler springs representing the nonlinear soil-pile interaction. Patch loads representing forces due to plastic hinges forming in the columns were applied to the shell elements that modelled the pilecap. The design ground acceleration in this contract could exceed 0.6g due to near-fault zones and the LUSAS analysis permitted stresses in the piles and pilecaps to be determined allowing for nonlinear soil behaviour. The models were also used to calculate the translational and rotational stiffnesses of the foundation which has a significant effect on the earthquake loads predicted by the response spectrum analysis. The foundation models were used to obtain pile design forces and moments, and then by slicing sections through critical sections of the pilecap, Clarke-Nielsen forces were derived for reinforcement design. For each automatically created model, design response spectrum-equivalent earthquake records were applied to column bases in three directions simultaneously. This was done by using prescribed accelerations controlled with loadcurves. The columns were made as slender and flexible as possible to lengthen the structure periods and hence reduce the seismic demand on them. However, running contrary to this, it had also to be demonstrated that the substructure was sufficiently stiff to ensure safe operation of the railway during Taiwan's frequent earthquakes and to allow the safe stopping of a train during a seismic event should the need arise. The TSI analysis predicted less conservative relative movements between adjacent superstructures than a hand analysis, because it could allow for the restraint provided by the continuous welded rails. The LUSAS analysis also allowed direct calculation of stresses in the rails under earthquake loading. From the TSI analysis relative displacement histories for adjacent girders and stress histories for rails were obtained. By enveloping the results of all time steps maximum design values were obtained. For the superstructure analysis solid modelling was required to determine stresses due to distortion of end diaphragms and equilibrium effects within anchorage zones in the precast box girders. To do this, patch loads representing the prestress, bearing loads and seismic buffer force were applied to the model. Stresses produced were integrated to give forces and moments at each section in the end-blocks and results were used for reinforcement design. 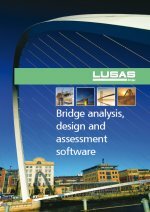 "The versatility of LUSAS Bridge coupled with the technical expertise within our Group helped produce an economical design for the extreme seismic performance criteria of the Taiwan project with its demanding programme and construction constraints." Client: Taiwan High Speed Rail Corporation.